Designation of Harlem’s St. Aloysius Church supported unanimously by Landmarks. Photo: LPC. The Harlem Catholic churches date from the late nineteenth, early twentieth century. On January 30, 2007, Landmarks voted to designate as individual landmarks Saint Aloysius Roman Catholic Church and the Church of All Saints Parish House and School. Landmarks first considered All Saints in 1966 and held hearings on both churches in 2004. Neither church was on the list, released in January 2007 by Cardinal Edward Egan, of parishes to be closed or merged. St. Aloysius, built by architect William W. Renwick between 1902 and 1904, originally served the Irish, Italian, and German immigrant community then prevalent in Harlem. As neighborhood demographics shifted, St. Aloysius focused on mission work and outreach and conversion in the African-American community. 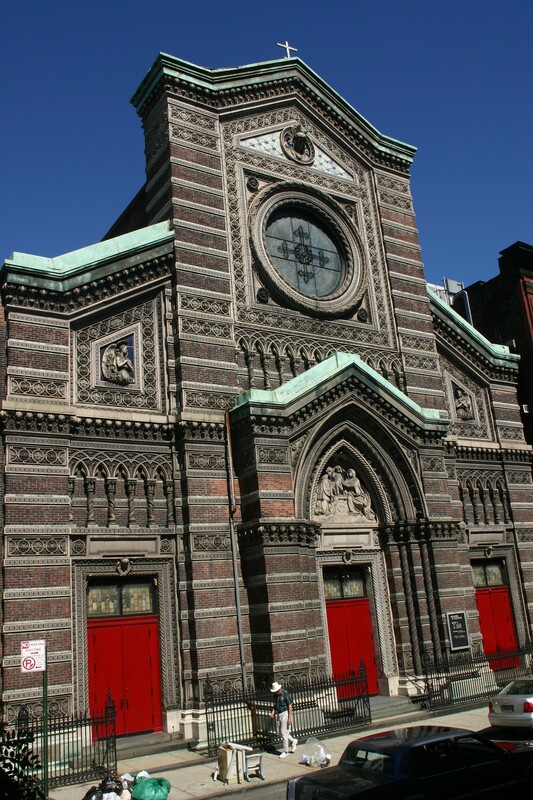 Built in an Italian Gothic style, St. Aloysius’ most striking feature remains its glazed terra cotta facade, featuring alternating bands of red and blue colored brick, with glazed celadon accents. The facade utilized the new technology of polychromatic glazed terra cotta, which emulated the marble of European cathedrals at a much lower cost. Landmarks Chair Robert B. Tierney opened discussion by noting that it had been 25 years since Landmarks had designated a Catholic church, and that parishioner Congressman Charles Rangel enthusiastically advocated designation. Commissioner Thomas Pike stated that designation was important to ensure that the church remained a continuing part of the fabric of the community. Built between 1883 and 1893, James Renwick, Jr. designed the Venetian Gothic Church of All Saints. He is also known for his designs of Grace Church, St. Patrick’s Cathedral, and St. Ann’s Episcopal Church in Brooklyn, all individually designated landmarks. Like St. Aloysius, All Saints Church boasts a multicolored terra cotta facade, as well as German-made stained-glass windows and delicate open spires. The four-story parish school, designed by William Renwick, features decorative banded brickwork and terra cotta ornamentation. Landmarks designated both St. Aloysius and All Saints unanimously. LPC: St. Aloysius Roman Catholic Church, 213 West 132nd Street (LP- 2164); Church of All Saints Parish House and School, 47 East 129th Street (LP-2165) (Jan. 30, 2007).